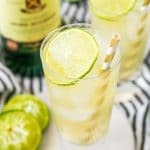 This simple cocktail is a bright mix of smooth Irish whiskey, ginger ale, and lime juice. And it's sure to make you want to dance! Fill a tall glass about 3/4 of the way with ice, feel free to also add a lime wedge or two. Pour whiskey over the ice. Add the lime juice and stir. Pour in the ginger beer. Garnish with a lime wedge and serve. Fill glass with ice, add whiskey, PAMA, ginger ale, and lime juice and stir. Top with a lime wedge.